Working on an Export feature which is simple and effective. It will allow you to export the details of your loaded Songs to a comma seperated file. You can then use this file as an archive of your metadata AND you can also open and edit values within a proper spreadsheet application and then import the changes back into Jaikoz. So its give you tag backup and mega editing capabilities in one go, and you can also use the file created to share your songs list with friends or to create playlists. There are a few decisions to be made yet though. 1. The export feature only works on the editable fields common to all formats so fields not supported by Jaikoz or only supported in the ID3 tabs view are not exported. 2. 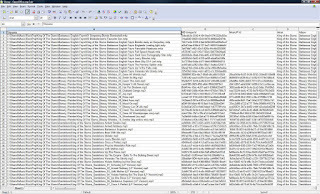 Artwork is not exported, its not appropriate to store large binary fields in this sort of file but I know artwork is very important to people so maybe it can be shoehorned into this feature somehow, or should I just have a seperate 'Export Artwork' that could export artwork either on a folder by folder by basis so its kept with the files or all lumped into a single folder. 3. The export only supports single instances of fields, so for example it would only export one genre per song. 4. Because not desirable to load all songs into Jaikoz in one go if you select a file that already exists Jaikoz should append the new entries, but would need to overwrite an entry if it already existed for the same file. 5. The first column of the created file would be the full filename, so that Import can work by matching the filename with a file open in Jaikoz and then update accordingly. 6. You might have two versions of a song , a flac version and a mp3 version and want to import metadata from the mp3 version to the flac file you would just have to edit the filename in the csv file. 7. If when exporting you are are replacing existing songs, should they be replaced in the same place, or afterwards. Would it be better to always sort the file alphabetically. 8. The data is encoded using utf8, this fully supports Unicode so all characters can be encoded and also it is economical with memory - only one byte is used for ascii chars. The only problem is that it is only the default encoding on Linux, so might not be the default choice when the csv file is open with some applications. For example Open Office on Windows Vista assumes that the encoding is windows-1252 , you have to tell it to use utf8. 9. In the future would also like to alow export to an xml format but xml not terribly useful for editing, this would also provide a solution for (3). 10. Could also create native spreadsheet formats such as .xls or .ods which is slightly more user friendly, but I dont think the extra effort involved is worth it at the moment. Jaikoz 2.8.4 now out with a few enhancements and a host of bugs fixes, some introduced in earlier versions, and there lies the rub. I've been concentrating on bug fixes recently and small enhancements rather than new features but the regressions came about due to not enough testing. It is very difficult to get the balance right, I have automated tests that cover the reading and writing of metadata but not automated tests for the Jaikoz GUI itself. So do I spend my time writing more tests, fixing problems or adding new features ? I think the correct answer is to continue with all three, and ensure I do beta releases of all major releases, but has anyone else got any other views. In Jaikoz 2.8.2 I added support for opening Winamp Playlists, the most widely accepted playlist format. But I knew that what many of you really wanted is to drag and drop iTunes playlists, well you can - nearly. The difficulties with iTune playlists are twofold. Firstly there is no playlist file so you have to communicate with iTunes instead of just reading the file. Secondly talking to iTunes is very different on Windows than on OSX , so the work effort doubles. I now have dragging playlists from iTunes working beautifully on Windows and this will be available in Jaikoz 2.8.4 out today or tomorrow. But OSX does not allow the playlist to be dragged to anywhere except iTunes itself (please anyone correct me if Im wrong) so it is impossible to even initiate a playlist drop. Instead I'll be creating some scripts for the iTunes Script Menu to allow you to send playlists to iTunes.